Indulge your self and experience the softest and most realistic, natural looking faux fur ever with this fashionable Arctic fox faux fur throw. 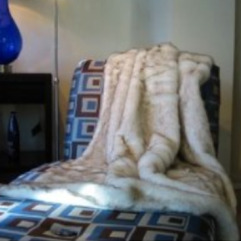 Our Fox fur throw is perhaps the most elegant you will find. Snow white fibers are graciously tipped with brown/black to replicate the luxurious winter fur of the Arctic Fox. The faux fur replicates the insulating winter coat of the Arctic Fox and for exceptional warmth, it offers double sided fur. Luxurious front fibers may be up to 1 1/2″. The sleek and silky feel faux fur lining is made with plush snow-white short-pile. * Elegant white fibers are gently tipped with black. * Fibers vary in length from 1/2 inch to 1 1/5 inches. * Extra length so that our tall customers can keep their toes warm during those chilly afternoon naps. * Silky white faux fur backing material make this a cozy warm throw blanket. * Machine washable (cold water gentle cycle) and may be air dried (no machine or heat, please).